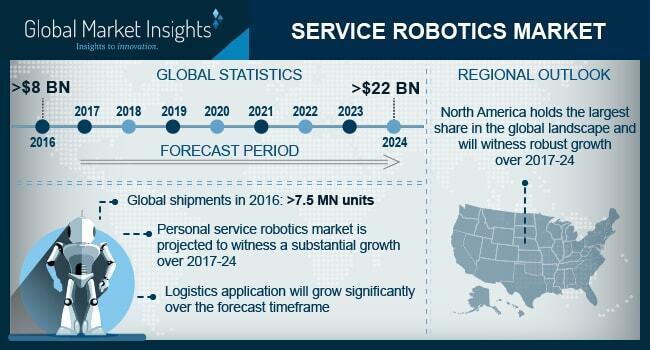 Service Robotics Market size is set to exceed USD 22 billion by 2024; according to a new research report by Global Market Insights, Inc. The shipments are forecast to grow at over 20% CAGR from 2017 to 2024. Companies in the service robotics market comprise iRobot, DJI, Intuitive Surgical, Inc., Parrot SA, Bluefin Robotics, Northrop Grumman Corporation, DeLaval, Lely, Medtronic, Yujin Robot, Samsung Electronics, Honda Motors Corp., 3D Robotics, AeroVironment, Inc., Ecovacs Robotics, and Softbank Robotics. The industry is highly competitive in nature followed by the presence of a large number of players. Furthermore, the industry is rapidly evolving and is subjected to shifting consumer needs and changing technologies. Industry players are heavily investing in R&D and increasingly focusing in the areas of product development and maintenance & support services.